Two things I hate are getting up early, and driving in heavy traffic. This morning I did both, for the sake of The Car. To maintain the three year used-car warranty (which mind you only covers certain types of faults, and under fairly specific circumstances), I need to take it back to them every 6 months for a service, or a “safety check” if it’s not due for a service (which it rarely is, as I drive so little). Thankfully I don’t have to go all the way to flippin’ Melton for that; but the closest one is in Footscray. This either involves being organised enough to stay at Marita’s overnight (which I didn’t do), or getting up way earlier than I’m used to and driving across town in an effort to beat the traffic. So this morning I the alarm went off at about 6:25, I was conscious and eating breakfast a few minutes later, in the shower at about 6:50, and out the door by 7:10. Now I know some would be scoffing at this and saying that’s not early at all. But it is for me. Brad with the traffic on 774 was saying it was a CFMEU rostered day off today, and this was helping the traffic. I can only assume it’s pretty horrible normally then, because I got stuck on Brighton Road, St Kilda Road, Queens Road, and Kingsway. Sure, it was only for a short period each time, but it really makes me appreciate that I don’t have to fight my way through the traffic every day. I don’t know how people do it. So could I beat the traffic getting the car home? I checked with my sister, who works in South Melbourne and sees it every day — she said Kingsway is fine at 4:55pm, but clogs up just after five. Originally they’d said the car would be ready at 4pm. Plenty of time to get across the bridge before 5pm. But then wouldn’t you know it, they rang at 3:15 saying it was advisable to replace the external drive belt (whatever the hell that is, apart from another $140), revising the pickup time to 4:30. D’oh! As it happened I turned onto Kingsway just after the 5pm radio news came on. And actually, it wasn’t too bad, and I made it home in one piece. Maybe that CFMEU RDO really did make the difference. Never mind, your letter in the paper today was good and it made top billing. i’m intrigued, i thought u and Marita lived together- is this not the case? do you have the boys full time? if so, great job mate! Yeah I’m a bit puzzled over that too Rachel? I don’t blab about that kind of thing very often, but no, we don’t live together. The RDO makes a huge difference to traffic. Tuesday and Wednesday mornings, about the the time you were on Queens Road, traffic was banked back to more than half the length of Queens Road. Now, why did I not notice this morning? Maybe it was free flowing. 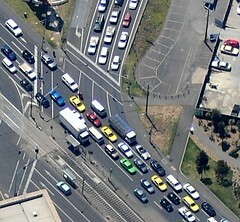 It is usually West Gate Freeway that causes the problem. The “external drive belt” is a cheap-arsed substitute for a real metal internal, oil lubricated, Timing Chain. It connects the crankshaft down the bottom of the engine to the camshaft(s) at the top of the engine. Early Holdens that had push-rod operated valves and the camshaft down in the middle of the engine didn’t use a chain, they just had two meshing gears. The driven gear was a fibre composition rather than metal, and was a weak point, much like the rubber belts now common. Thanks Allan. I did wonder! The mechanic recommended it be done now, not later, so I went ahead with it.